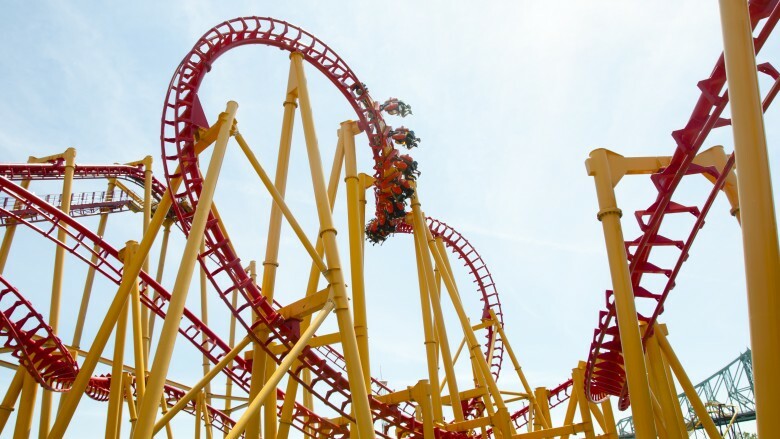 For anyone who harbors unfulfilled dreams of being a fighter pilot, then riding a roller coaster might be one the closest approximations, and that's because of the G forces. When you are standing in one place on the ground, you are experiencing 1G, or 1 times the force of gravity. This is normal, and our bodies have evolved to cope with it. Take a corner in a fast car and you will feel yourself being pushed towards the outside of the turn — this is an example of G forces acting on you in unfamiliar directions, but in most regular forms of transport, it's usually nothing more than a light push that you barely notice. On a roller coaster, however, the G forces can get much higher than you'd otherwise normally experience, and for many people that's part of the fun. But the sensation of being pushed around in your seat is not the only effect, because as the G forces increase, you effectively weigh more. If you weigh 150 pounds, and you experience 2 G, you are feeling what it would be like to weigh 300 pounds in normal gravity. And that's not all because since your insides are not fixed rigidly in place, they move around as well, and that's especially true for your blood. At normal gravity your blood pressure is naturally higher in your feet than in your head, and your heart and circulatory system is used to working with that. But under increasing gravity your blood flows towards your feet, and your heart finds it harder to get it back up to your brain. Ultimately, if G forces get too high, this results first in "grey out" where your vision fades, and then unconsciousness, because with the blood all pooling in your lower limbs, there's too little left to bring oxygen to your brain. Never fear however, because though roller coasters feel pretty extreme at times, the manufacturers don't let things get that far. After all, no one want to buy a photo of themselves asleep at the theme park. 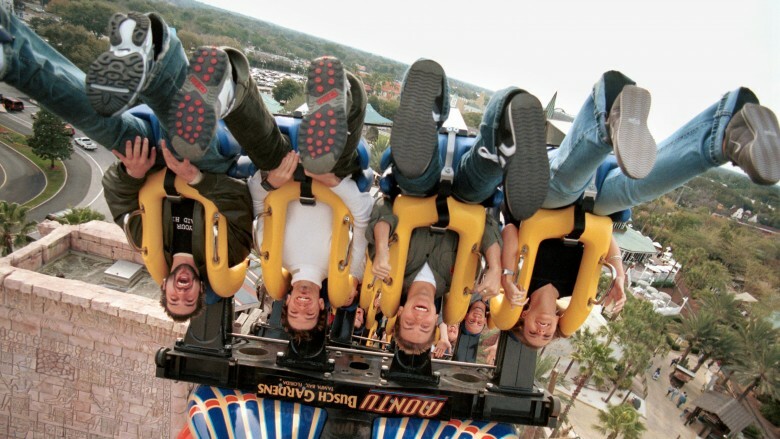 Going round a loop in a roller coaster, with your feet on the outside of the turn, creates what's called "positive" G forces, which are the kind that make your blood go to your feet. But go round the loop with your head on the outside of the turn, creating what's called "negative" G forces, and suddenly your skull is the place for blood to be. The human body can tolerate less-negative G forces that positive, because it's a reverse of the way nature designed our bodies to work, and too much of it can be "unpleasant." But before you get there (and you won't get there on a roller coaster), several things will happen. First the pressure in your head will increase, which will feel weird, then if things keep going, you will experience what's called "red out." This is the experience of seeing your vision turn red from all the extra blood in your head, and while rare, has been known to happen on roller coasters. If the negative G forces increase further, small blood vessels could burst in your eyes and then you pass out … but probably not if you're on a roller coaster. Over short periods, and in small doses, a little extra blood to the head is mostly just a bit of good fun. Considering that roller coasters mostly involve a lot of sitting down, it's surprising how high your heart rate gets. In fact, you'd almost think you were running around the track rather than riding, if your heart's response to the experience is any indication. 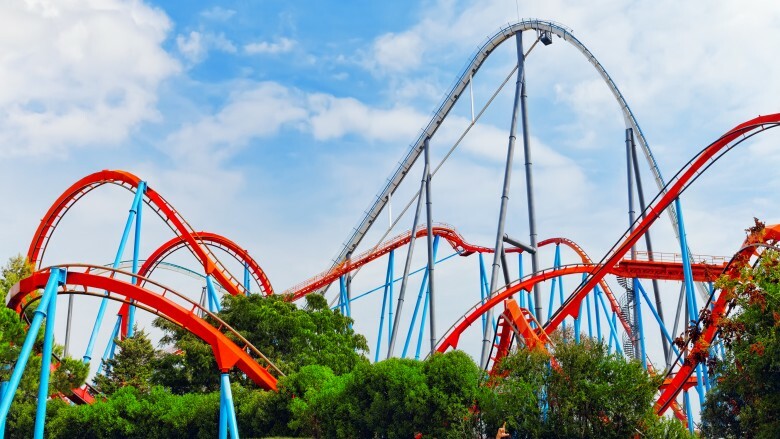 According to doctors at the University hospital of Mannheim in Germany, who attached heart rate monitors to visitors at a German theme park, a roller coaster rider's average heart rate jumps to 155 beats per minute after they jumped on the Expedition GeForce ride. But the peak didn't occur at the highest, fastest, sharpest turn, but rather at the slowest, because it was the slow climb before the first big drop that caused the most pounding. And the anticipation of that drop doesn't just get the heart pumping — it raised the blood pressure of the participants as well. In many ways, (assuming you don't have a serious undiagnosed heart problem), raised heart rate and blood pressure is probably a good thing as far as your enjoyment is concerned, because along with all that extra blood flowing around your body, there's extra oxygen and fuel feeding your cells which helps keep you alert, awake, and in the best condition to scream your lungs out and enjoy every minute of your thrill ride. It goes without saying that you're going to be secured to your seat on a roller coaster, but whatever bar or seat belt the ride comes with will almost always only restrain your torso. This means every other part of your body — your arms, legs, and head — are left flapping in the breeze. But while your arms and legs only need to deal with the weight of your hands and feet, your neck has an ungainly 11-pound mass (yes, we're talking about your giant squash) to support. 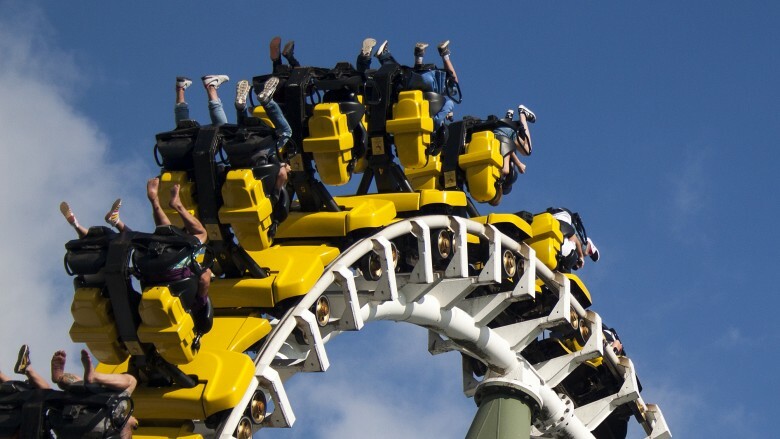 As the roller coaster shakes your body back and forth, and your head wobbles around on top, your neck muscles need to rapidly adjust to compensate for all the sudden movements, and keep your head from flapping around more than your spine can cope with. There's actually something you can do to help your neck muscles with their work, and that is simply to keep your eyes open and your head facing forward. Because having your eyes open allows you to see future movements coming, speed up your reactions, and reduce head movements. 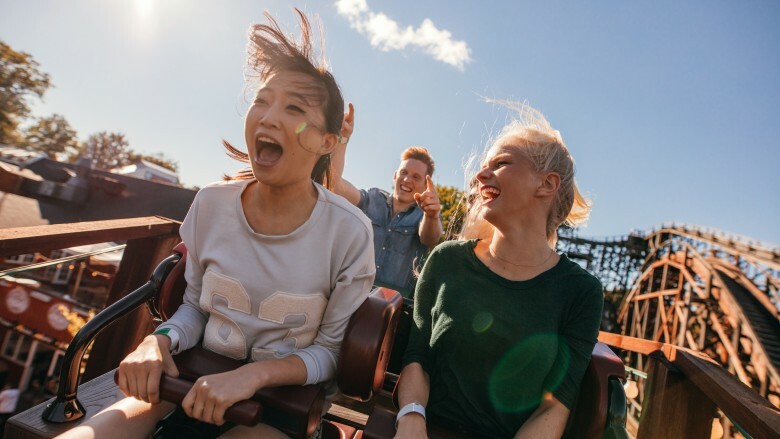 Having your head whipped about while your neck is twisted increases your risk of injury, so it's better to avoid staring into your loved ones' eyes while riding a roller coaster, and focus on the high velocity — and super-fun — matter at hand. As you whip around the track, and your arms, legs, and head are flopping around in the air like they really don't care, there's another part of your body flopping around as well. And no, it's not your tongue, or your hair (although they also flop around), but your brain. In order to protect itself from shock, the brain doesn't normally come into contact with the inside of your skull. Instead, your grey matter sits in a fluid-filled sac, allowing it to move a little and dissipate the force of impacts. But this only goes so far — with more severe impacts, especially ones that rotate the skull, the brain can come into contact with the hard skull and get damaged. Fortunately, though, you're very unlikely to encounter such forces on a roller coaster, but that doesn't mean your brain isn't moving. As your head bounces around with a goofy smile plastered across the front, your thinking sponge is following those motions, but with a slight delay. No need to worry — this is entirely normal and happens all the time … at least, all the time you're on a roller coaster. Over the many years of pre-roller coaster human history, our species has developed a couple ways to figure out which way is up. The first and most obvious is vision, because nothing helps you figure out which way is up quite like seeing it for yourself. We also have a complicated organ in our inner ear which, through a series of small curving tubes, liquids, and tiny hairs, tracks the movements of our heads and helps us be aware of our movements. When these systems work together, you get a relatively sophisticated understanding of your place in the world … unfortunately, however, these systems sometimes work against you. When you take a ride on a boat, in planes, cars, or a roller coaster, you can experience unusual movements, accelerations, and vibrations that your inner ear and eyes can have a hard time interpreting. Your brains actually uses information from your eyes to try and predict what movements your body is about to experience, but on roller coasters, and in other modern forms of transport and entertainment, these motions aren't always the ones your eyes see coming. And when the information coming from your inner ear doesn't quite match up with what your eyes are seeing (and what your brain thinks should be happening), then things get confused. According to researchers in Toronto, how you respond to this confusion can depend upon how old you are — since children's bodies are in a constant state of change, for them, the internal confusion can be exciting. But for adults, who are used to things being predictable, motion sickness, dizziness, and nausea can be the unfortunate result. But hey — that just means shorter lines for the rest of us. Humans weren't designed to ride on roller coasters. That's not to say we shouldn't, just that they didn't exist when the fundamentals of human physiology were being worked out. What did exist were a lot of dangerous wild animals, and other life-threatening situations that required the evolution of specific bodily functions to survive. Functions like hormones. 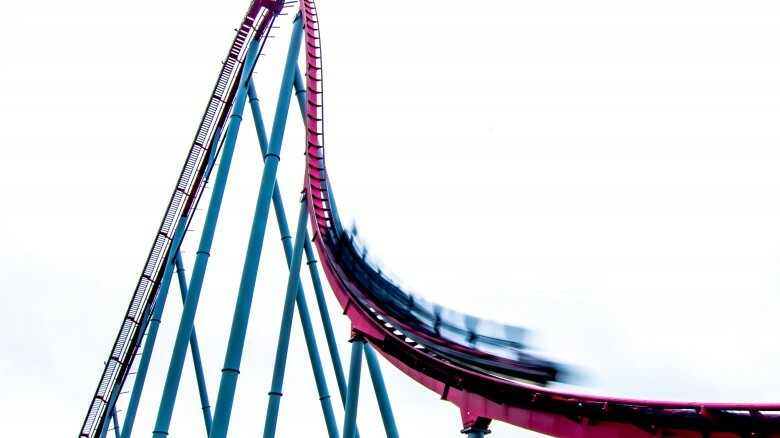 When you find yourself in a stressful situation, be it almost hitting a deer on the highway, jumping in your seat while watching a horror movie, getting an unexpected e-mail from your boss, or slowly climbing a steep track while strapped into a roller coaster seat, your body reacts by releasing a cocktail of hormones into your bloodstream. This release isn't conscious, but happens automatically in response to potential threats. These hormones include adrenaline, norepinephrine, and cortisol, and between them, they stimulate a series of "valuable" physical reactions. Adrenaline and norepinephrine are released almost immediately after you become aware of the threat, and together they raise your heart rate, concentrate blood flow towards muscles, lungs, and the brain, give you a boost of energy, and make you more alert and focused. Cortisol arrives a bit more slowly, and helps regulate body functions while under stress. This is very useful if you need a quick burst of speed and strength to escape the sudden appearance of a large predator, but less valuable when facing a modern "threat," like a tight deadline. But on a roller coaster, it can actually benefit your experience, since being alert and awake can only help you get the most out of the being flung all over the sky. For many people, the sudden flood of these hormones feels exciting, making them "feel more alive" and alert than is possible during their day-to-day life, and that's not really surprising. There's nothing like a brush with death to make you feel happy to be alive, and in the absence of man-eating tigers, a roller coaster will just have to do. If there's one thing that goes hand-in-sweaty-hand with a roller coaster ride, it's screaming. 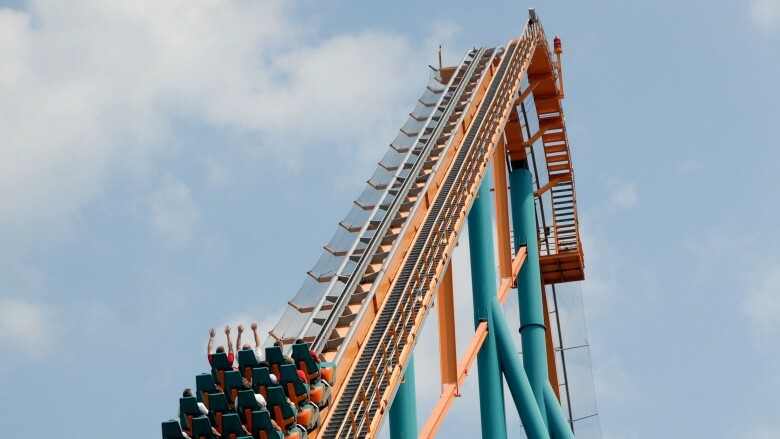 People can't help but let loose a blood-curdling lungful when the car they're in starts to plummet — while that's usually an unpleasant experience (especially when they do it right in your ear), on a roller coaster it's an inescapable part of the experience … and that might be a good thing. 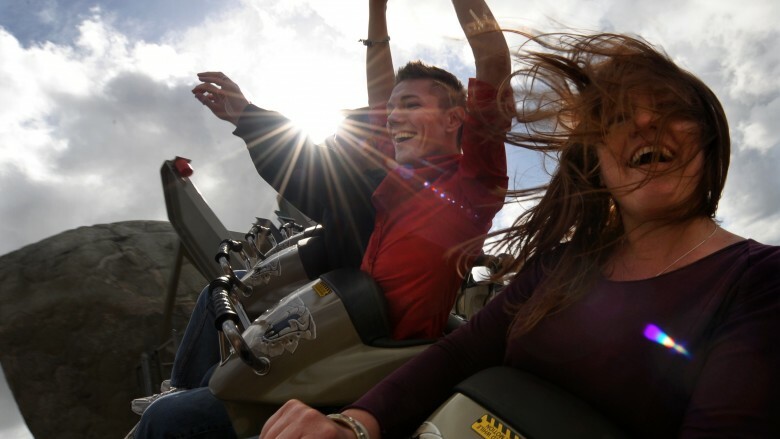 The way your body reacts to the "threat" of a roller coaster is clearly important to the excitement of the experience — according to a study at the university of Geneva, the screams you hear as you start to fall are an important part of that. That's because, although our ears hear a lot of variation in human voices, nothing stands out from the babble quite like a scream. Screams stand out because, unlike regular talking, which involves relatively smooth modulations, screams rapidly cycle through a multitude of high frequencies that our brains are actually programmed to react to in specific ways. Screams, and similar sounds like emergency alarms, stimulate a region of the brain called the amygdala, which is associated with fear, and controls our responses to threats. The amygdala also controls the release endorphins — our body's self prescribed painkiller — which, along with helping us ignore injuries during life-threatening situations, also make us feel pretty good the rest of the time. So, next time your neighbor on the excitement railway screams in your ear, don't scowl. It just wouldn't be the same without them.